Everything in our society teaches us to move away from suffering, to move out of neighbourhoods where there is high crime, to move away from people who don’t look like us. But the gospel calls us to something altogether different. We are to laugh at fear, to lean into suffering, to open ourselves to the stranger. Advent is the season when we remember how Jesus put on flesh and moved into the neighbourhood. God getting born in a barn reminds us that God shows up in the most forsaken corners of the earth. Movements throughout church history have gone to the desert, to the slums, to the most difficult places on earth to follow Jesus. For some of us that means remaining in difficult neighbourhoods that we were born into even though folks may think we are crazy for not moving out. For others it means returning to a difficult neighbourhood after heading off to college or job training to acquire skills – choosing to bring those skills back to where we came from to help restore the broken streets. And for others it may mean relocating our lives from places of so-called privilege to an abandoned place to offer our gifts for God’s kingdom. Wherever we come from, Jesus teaches us that good can happen where we are, even if real-estate agents and politicians aren’t interested in our neighbourhoods. Jesus comes from Nazareth, a town from which folks said nothing good could come. He knew suffering from the moment he entered the world as a baby refugee born in in the middle of a genocide. Jesus knew poverty and pain until he was tortured and executed on a Roman cross. The is the Jesus we are called to follow. With his coming we learn that the most dangerous place for Christians to be is in comfort and safety, detached from the sufferings of others. Places that are physically safe can be spiritually deadly. One of the best stories of community in the United States comes from the backwoods of Georgia. In the 1940s, long before the civil rights movement had begun to question the racial divisions in the South, white folks and black folks came together to start Koinonia Farm – a “demonstration plot”for the kingdom of God, as they called it. Koinonia survived attacks from the Ku Klux Klan in the ’50s and ’60s, tilling the soil and sowing seeds for God’s movement in the least likely of places. On Monday afternoon, August 13, 2018, city staff will be presenting an affordable housing framework to City Council Executive. 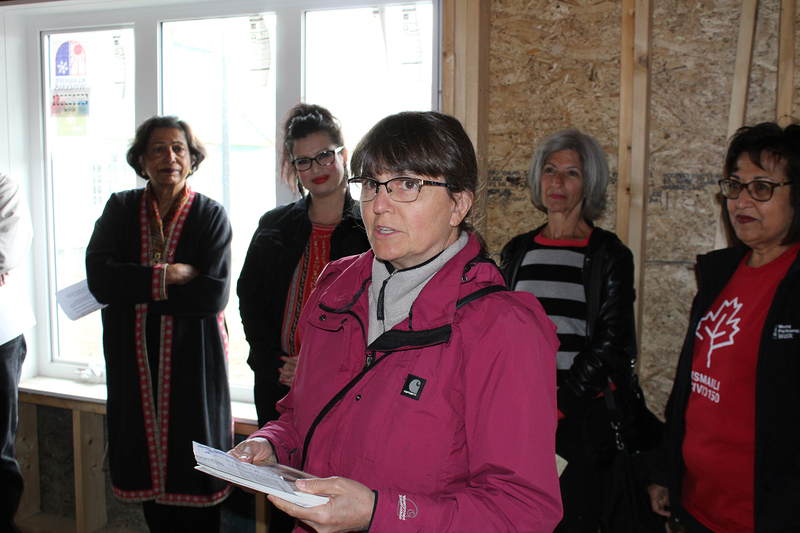 The need for such a framework is driven by the reality of a steep rise in housing cost in many Canadian cities since the turn of the millenium, and numbers from Statistics Canada that tell us almost 50,000 renter households In Edmonton face difficulty finding housing they can afford. 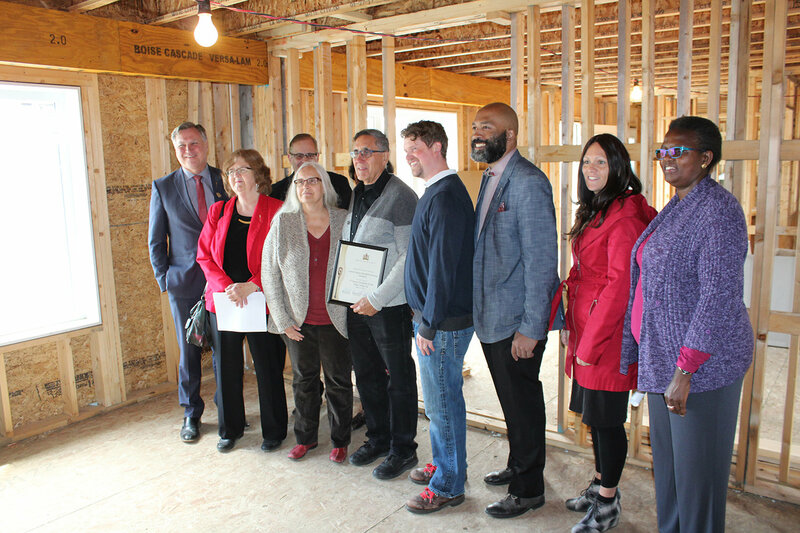 That to meet the current needs of Edmontonians, the City encourages affordable housing city-wide, and aspires to 16% affordable housing in all neighbourhoods and wards. That all new affordable housing projects are evaluated against the same five criteria to ensure consistency and transparency. This framework aims to provide a consistent way to assess affordable housing funding proposals from community organizations and the private sector. 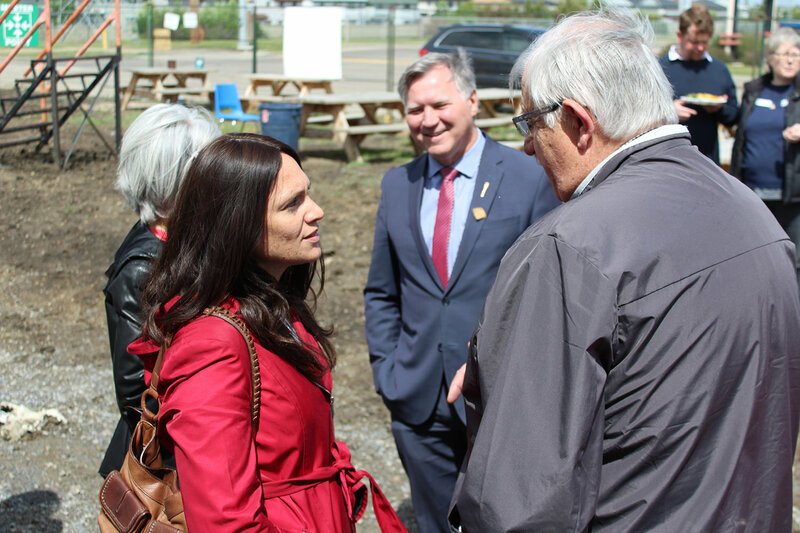 This means that every affordable housing proposal will be evaluated using the same five criteria, and the existing neighbourhood context and services will be taken into consideration when the City looks at funding affordable housing. A 16% guideline for distribution of affordable housing across Edmonton is not high, and in itself poses no threat to neighbourhood vitality. The research shows little correlation between rates of non-market housing and neighbourhood distress here in Edmonton. The 16% suggested target is not high when one considers the practice of other jurisdictions with social safety nets comparable to Canada. For example: the floating city of Ijburg in the Netherlands is intentionally designed with 30% Social housing, 30% home ownership, and 40% market rental on each block. The Netherlands has been intentionally designing communities with a steady integration of non-market and mixed-income housing developments since the second world war. How much is too much? and supporting research. Interested to come see and hear the report on August 13? CRIHI will be there to hear and respond to this report, and is inviting faith community folks to come out in a show of support for meaningful housing solutions. We anticipate a great deal of interest from other groups as well, so there is likely to be a fairly strong lineup of people to speak to this report. CRIHI’s voice will be one of them. This meeting is designated time specific to begin at 1:30 on Monday, August 13 at City Hall, in the River Valley Room. The Dutch have been at this a long time. Initial efforts to provide more affordable housing were actually started by private merchants and industrialists in the 1800s who wanted better housing for their workers. In the early 1900s the government began to be involved, and supported the development of housing associations. Following WWII, these Housing Associations took on a major role in helping rebuild the country’s housing stock, with intentional focus on making affordable housing accessible to low-income populations all across the country. In the 1990s, a new deal was made with housing associations, pulling out all government subsidies in exchange for significant freedom in their continued development of housing with at least a portion of this being affordable/social housing. In recent years, changing regulations, new government tax levies coupled with rising pressures from land scarcity and an influx of new migrants have made this work much harder. But so much has been done right over the years that the Netherlands is handling these pressures better than many of their counterparts in the EU. In the Netherlands today, Housing Associations provide for around 60% of the country’s population. Social housing accounts for 37 per cent of the total stock across the country, and as much as 75 per cent of the total rented stock. There are well over 300 housing associations at work across the country, with at least one in every municipality. They are required to function within governmental frameworks, but operate with some freedom, catering to market demand while carrying a social duty to provide for low-income populations. Many of these housing associations also invest in the life and health of the local community, supporting the growth of local businesses, local schools, and local services like Libraries and community gathering spaces. Of particular significance has been the Dutch emphasis on Integration. Housing associations have long created sustainable mixed-income developments with breakdowns such as: 20% low income; 60% middle income; 20% high income. In these developments, high income housing helps pay for the low income housing to make it a sustainable model for market development. As of 1994, housing associations have been able to continue to build on this model entirely without government funding. Now there is no magic to this model. Tensions around race, class, faith or cultural background do not simply evaporate when people live in proximity. These mixed income blocks in the Netherlands experience tensions between homeowners and social renters. But when there is some effort on all sides to bridge gaps, it often leads to a much better understanding of existing issues. In some settings, a community manager was employed to assist with this connection and support efforts at bridge building. Another example of the Dutch emphasis on integration are the housing units planned and built in the floating city of IJburg (pictured below). Home to around 20,000 people already, with around 45,000 anticipated upon completion, Housing breakdowns in Ijburg are divided into three categories: 30% of affordable rental units, 30% of private properties, and 40% of market-rate rental units. Each block in IJburg includes these three categories, mixing homeowners, social, and market-rate renters. All residents share playgrounds, courtyards, public squares, shopping centres and canals. Does integration make a difference? In other EU countries, like France and Sweden, market forces have largely determined where high-income and low-income housing is located. That has led to some segregation and even the ghettoization of different populations. That dynamic has flavoured how well these countries are able to respond to and integrate the influx of migrants and refugees. New migrants are forced to find homes in less desirable areas of the city, where they often experience less opportunity for employment, negative stigmas, higher stress, longer commutes to work, and less access to social supports. These challenges serve as significant barriers to healthy integration, and sometimes result in high levels of tension and conflict. The city of London, in the United Kingdom currently struggles to bring in workers to do low-paying jobs, as local housing is so expensive and low-income workers have to commute as much as two hours. By way of contrast, In the Netherlands migrants and other low-income populations have much greater choices available for where they can live. They also benefit from much easier access to support services, and are naturally integrated into the fabric of the community. Better opportunity for work and for relationship with more established Dutch neighbours makes a difference on how they think about and find their place in their new home. As has been noted, there is no magic to this approach, and intentional efforts at community-building are necessary to make it work, but the Dutch example shows it can work well. How do the Dutch rank in the EU on social housing? “The data show the highest rates of satisfaction in Austria and Finland, followed by Denmark, the Netherlands and Sweden – countries where the social housing sector (or actually municipal rental housing in the case of Sweden) is relatively large and typically houses a wide and diversified population group. Malta also shows a rate of satisfaction, despite having a smaller social housing sector. In all of CRIHI’s publications and resources, we tell stories. Stories give us new ideas and inspiration. They help us see what’s possible. And some of the best stories we have told are those of faith communities in action. If you tune in to the Neighbourly, or have explored our website you have almost certainly seen, heard and hopefully been inspired by what different faith groups are doing. Stories of hospitality and compassion; of generosity and sacrifice; of food shared, homes built, programs run, and relationships forged. Guess what? We as faith communities have many more stories and ideas to share. 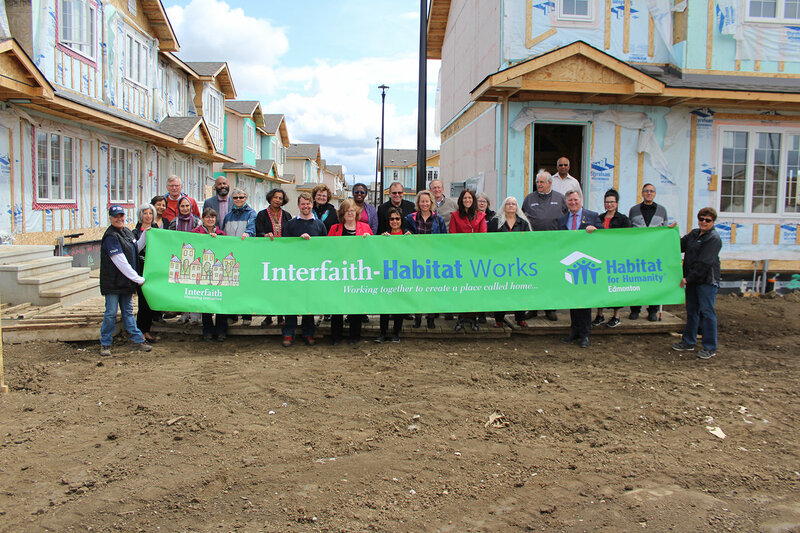 CRIHI continues to offer the use of our website and the Neighbourly to serve as a story hub for the Interfaith Community, and we hope you will take advantage of it! Tell us what your church, temple, synagogue, mosque or gurdwara is doing, trying, and learning in your community. Write it up yourself, or invite us to come and see. We can do an interview, take a few pictures and write it up so that others can learn from what is happening in your community. 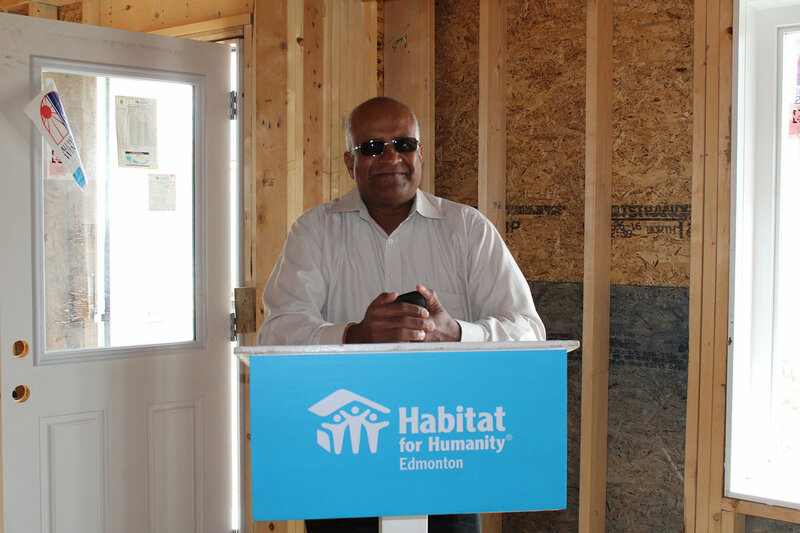 We will share your story in our monthly newsletter, the Neighbourly, and on our website and facebook. Nothing inspires or shapes people like a story. Let us tell yours! Efforts to Aid Heavy users of Service Paying Off! 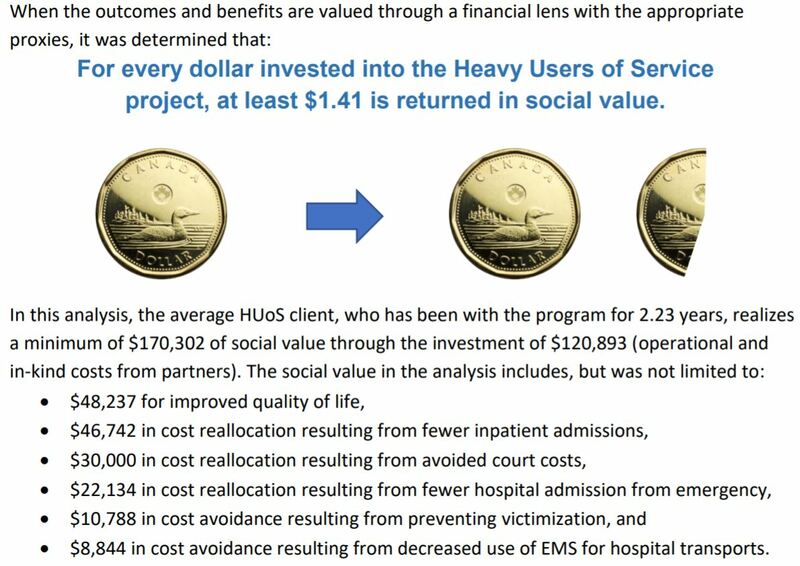 The Heavy Users of Services (HUoS) project was launched in 2013 as a partnership consisting of 16 groups including health and social service providers, first responders, justice services, Indigenous-focused organizations, and government representatives. The initiative was developed as a response to community members who are highly vulnerable, cycle through the systems, and repeatedly “fall through the cracks”. By establishing an MOU (Memorandum of Understanding) and consent forms, agencies were able to share information across sectors, facilitating more comprehensive and holistic service delivery. ▪ people for whom systemic barriers and gaps prevent or reduce access to supports, treatment, and programming. 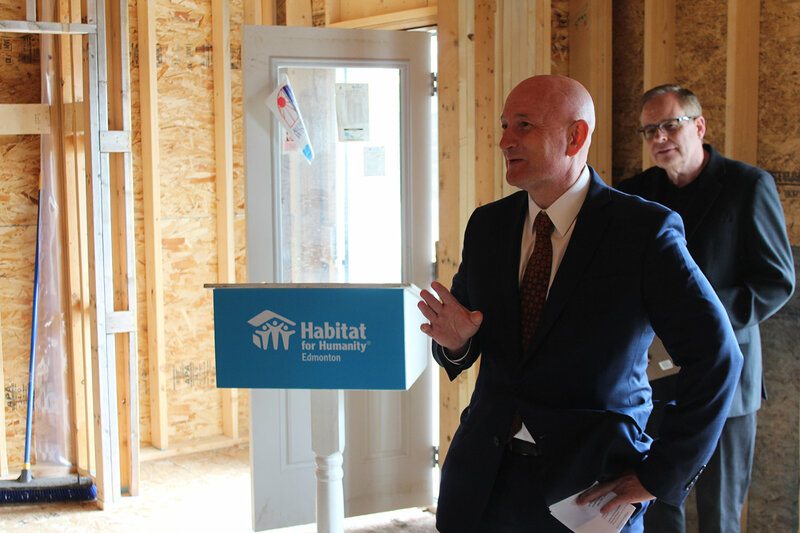 The project worked to coordinate efforts from numerous angles, including better communication, provision of housing and supports, and committed case management resources. The Project team was also able to quantify the return on investment, with demonstrated cost savings to the system, along with measurable improvements in the lives of clients. IN SUMMARY: This report reinforces previous findings that were prevalent in the launch of the ten year plan. 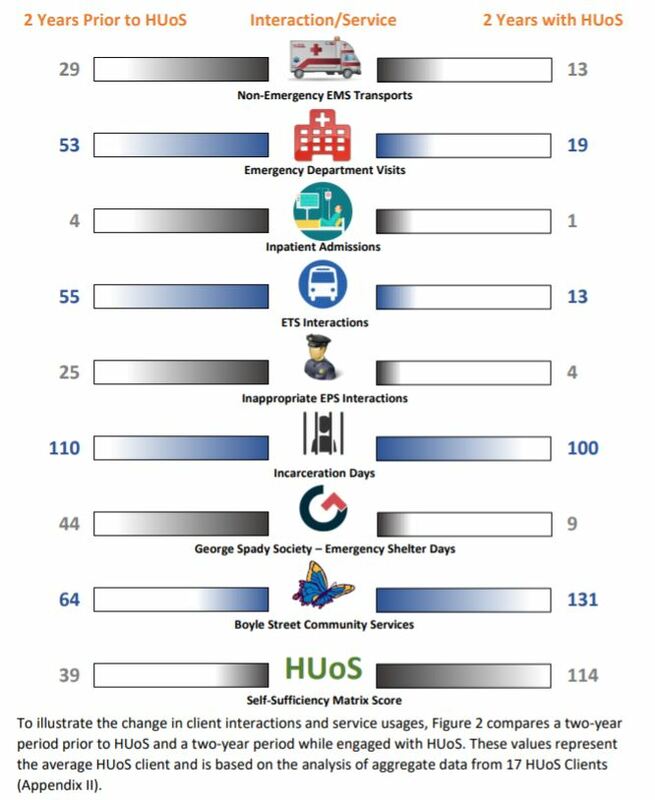 It highlights the quantifiable data that says not only are tools such as coordinated support services and provision of housing cheaper than services that just keeping someone alive on the street, they also work to measurably improve a person’s quality of life!